Making games is a lot of fun, and it's even more fun when collaborating with others. Come to the meetup if you're into game development, whether you've got experience making games or just want to learn more about it. It'll be a great chance to make some friends who share your interests, get some insights from others in the industry, or even start some collaborations. If you've thought about making games before and just want to get an idea of what all is involved is the development process, feel free to come and we can share some of our experiences with you. Columbus now has several colleges offering various game design and development courses which will hopefully lead to more job and collaborative opportunities here in Central Ohio, and my hope is to bring together students, professionals, entrepreneurs and hobbiests to talk about things like the future of games, artificial intelligence, graphic design, innovative game concepts, what makes games fun and successful in general, and new and different ways of monetizing games. About The Central Ohio Gamedev Group December 13, 2010 6:17 PM Todd B. Meet and socialize with local professional and aspiring video game developers to talk about game development, design, and the game industry. Programmers, artists, designers, and anyone else interested in game development are invited to join. Let's show the world that Ohio is the next hot spot for the video game industry! Anyone is welcome to show up at a our meetings. From hobbyists and students who want to learn more about the best way to get into the game developments industry to professionals who want to talk about the newest tech and share their experiences. 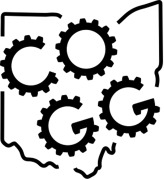 Check out COGG's Facebook page to have more conversations with developers around Central Ohio: https://www.facebook.com/groups/thecogg/. Check out the OSU Game Creation Club if you're an OSU student. If you're looking for other game developer groups in Ohio, we have plenty! Check out the The Cleveland Game Developers, CLE Game Co-Op, IGDA Cincinnati, Columbus Unreal Engine Meetup, Youngstown Game Developers, Coal Creek Game Devs (CCGD), and more! If you like VR, we have quite a few there as well: VR Columbus, CLEVR (Cleveland Virtual Reality) Community, and Cincinnati Virtual Reality. Our meetings often lasts 3-4 hours. The focus of this group is mostly social. We have occurring monthly GameDev Meetup events on the last Saturday and Prototype and Play on the 2nd Friday of the month. Come out and say hi!